I always loved the colors in the bowl, but the flashed on color just didn't hold up very well. 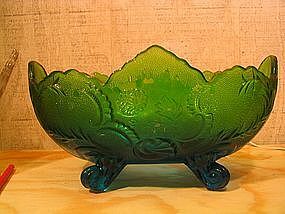 I bought 2 of these bowls over 20 years ago and 10 years of that time was spent boxed up in my basement. I never abused them, but when I unpacked them to photograph, I was so surprised to see the loss to the finish. There are no chips, cracks or breaks. Please email for additional photos to show the condition. I need your zip code to calculate the postage.